Nasturtiums are one of those fantastic plants that combine ease of growth with good looks. Their big tough seeds always come up and the plants seem to survive whatever you or the weather might throw at them. I plant trailing nasturtium seeds around the edges of the pots on my small London terrace every year, and they always produce a riot of healthy green leaves and dazzling colour that lasts right through to the start of winter. The fronds even continue to grow when I bring them indoors and put them in a vase! The flowers are edible, and look lovely in a salad as well as adding a hint of pepperiness, though they produce so many blossoms it’s hard to eat them all. But these are not all lost to the kitchen! For almost every flower you leave to wither on the plant, you’ll get a seed. These start out green, and dry to a whitish yellow. There are always far more than I want to plant for next year, so I was intrigued to hear about the idea that they could make an imitation caper. I love capers, and I love the spicy flavour of nasturtium flowers. This had to be a winner. You need to pick the seeds as young as possible, while they are green. I checked out a few versions of this process before I decided how to do it. 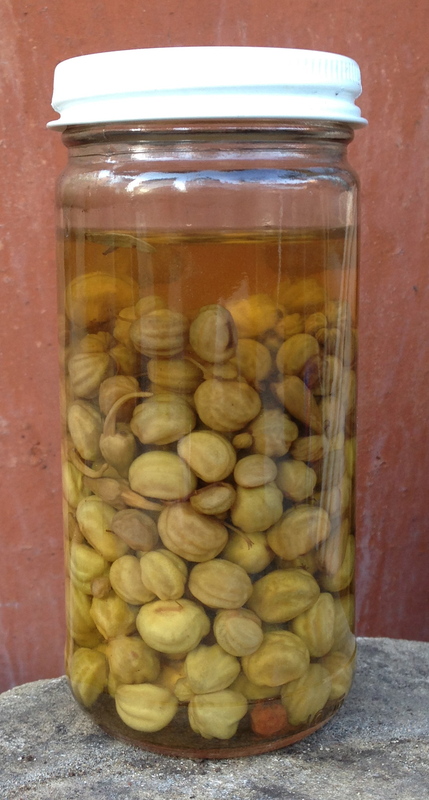 Quite a few recipes suggest either using a hot brine, or heating a vinegar and sugar pickle to pour over the seeds. I don’t think sugar and capers should have anything to do with one another, and I prefer to keep everything as crisp as possible. So, I went for a cold process, very much like the one recommended for ‘nasturtium capers’ in Pat Corbin’s River Cottage Preserve Handbook. Optional seasonings of your choice – try peppercorns and/chilli, plus a green herb like bay, dill or tarragon. Dissolve the salt in the water in a small bowl to make a brine. Add the nasturtium seeds, cover, and set aside for 24 hours. Drain the seeds, discarding the brine, and dry them on a cloth. Put them into a sterilised jar* along with any seasonings you’ve chosen, leaving about 1cm of space at the top. Fill the jar with vinegar, seal, and set aside in a cool dark place for a month before using. 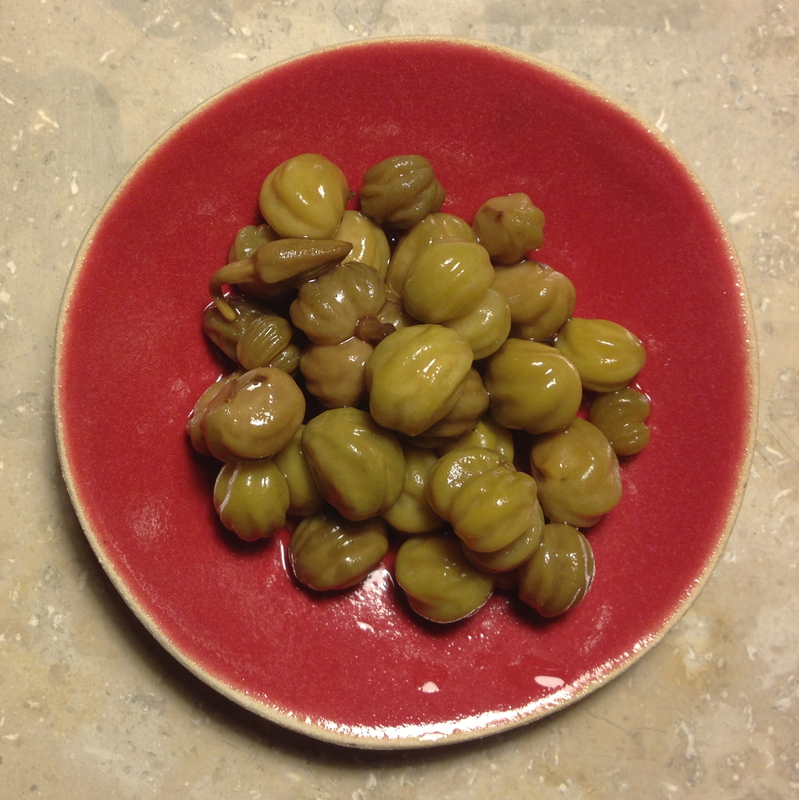 Once opened, refrigerate and use as you would use capers. *Remember that the vinegar will corrode a metal lid, so be sure to either use a well-lined lid or a glass jar with a rubber seal.